A couple of days ago we had a (relatively) mild, rain-free afternoon and Dan decided it would be a good opportunity to try to move another load of wood from the piles out in the field into our basement, where it’s easy to access two or three times a day (the woodstove being our only source of heat, we burn a fair bit). The wood in the field was here when we moved in, and our landlord gave us the freedom to use it as we needed it. I’m not sure what the full story is on it, but it’s obviously been stacked there for years – and years and years maybe – because the stuff that was well-covered is incredibly dry, and the stuff that wasn’t as well protected is, in some cases, starting to go a little punky. 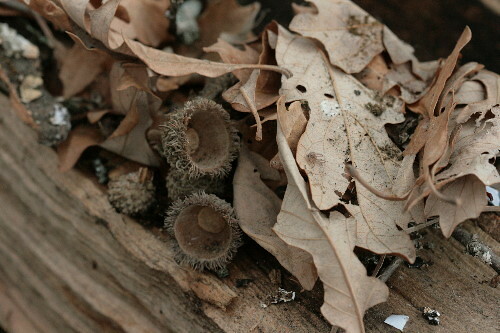 The log pile sits under a Bur Oak; many of the burry caps had collected in the gaps. 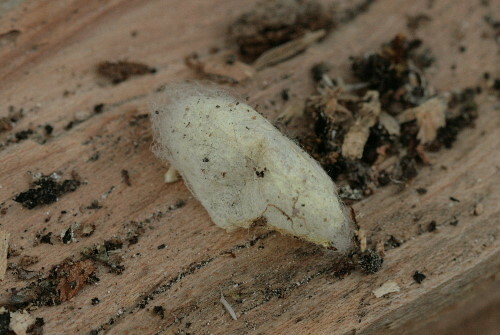 A white-bellied spider in a silk cocoon, alongside a dead pillbug/sowbug. 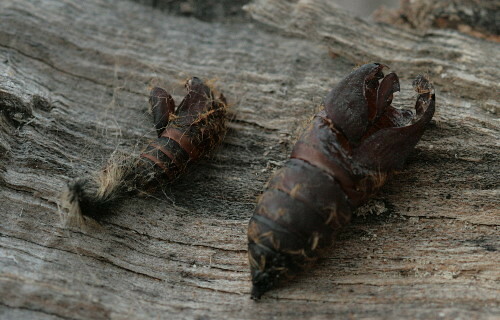 Gypsy Moth pupal shells - a male hatched out of the one on the left, a female out of the one on the right, as determined by size. 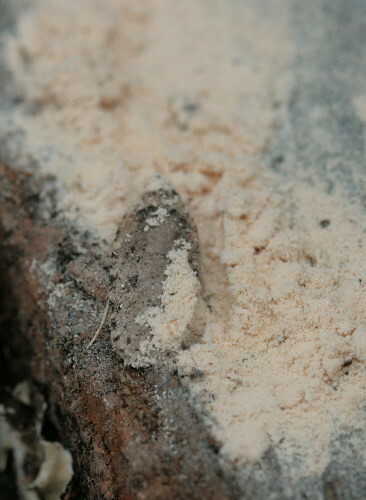 All of the sawdust that one moth is buried in came out of these tiny holes, created by some type of wood-boring insect and/or its larvae. 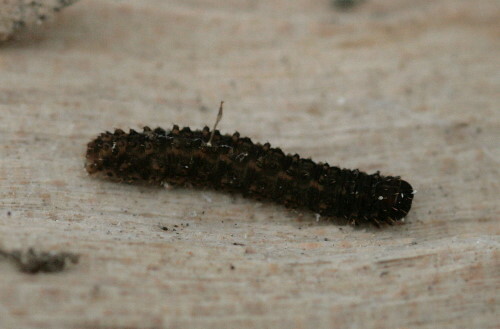 Great collection of goodies from your wood pile – always something living in there no matter the time of year. I love poking around such places, Amber. Always something to see. I love all the cool stuff in your wood pile. 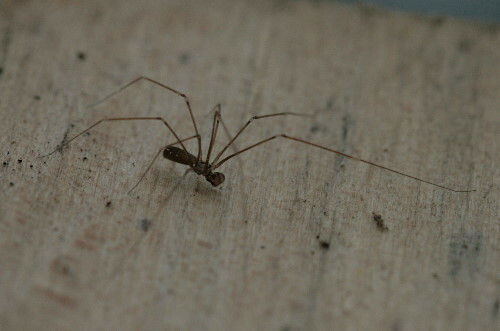 The skinny spider with the long legs and big round palps is probably a male Pholcus cellar spider. 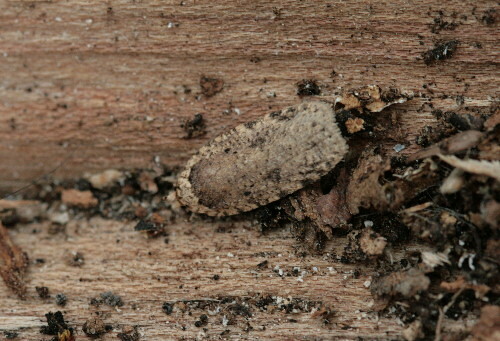 The crab spider toward the end (above some snake skin) may be a Philodromus sp. 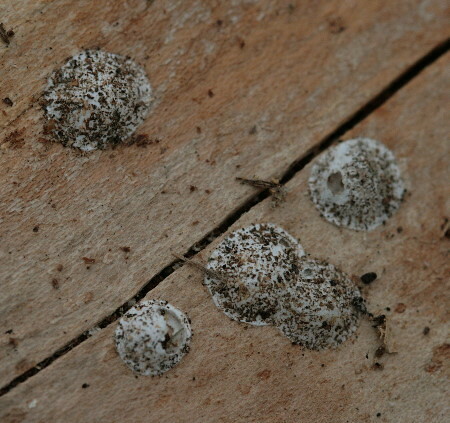 Your scale insects may actually be spider egg casings. 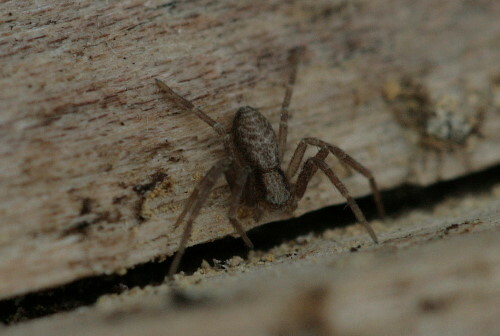 Philodromus make ones like these, but so do many others. 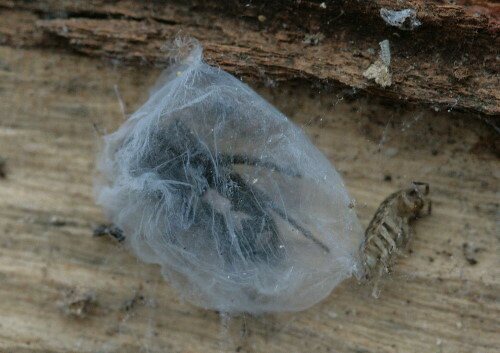 The very cool spider in a bag was probably a molting chamber, that may only be a shedding in there. I’m not great with snails, but the ones you have look much like the ones we have in NJ, which I believe to be Zonitoides sp. Somewhere to start at least. And I love your lab, in what I think of as the most classic lab pose, checking everything out. Thanks for all those helpful IDs, Sara. 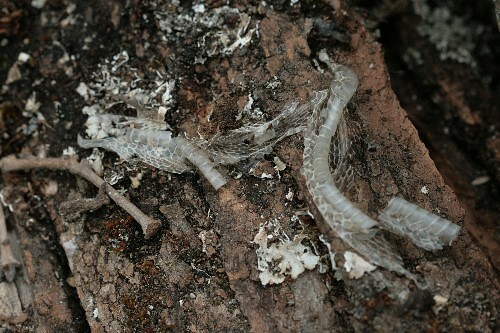 I didn’t know that about the spider egg casings. That would make sense. The spider-in-a-bag was actually alive; I poked at him gently and he twitched in that reluctant please-come-back-in-spring way. Those are some great finds! 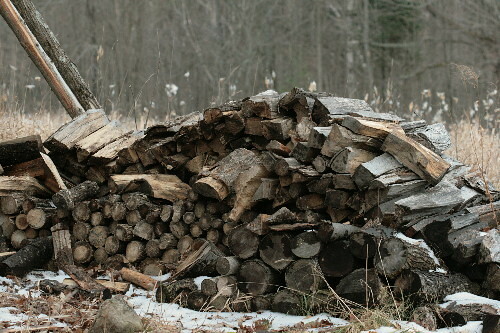 Our wood pile is a great source of buggy goodies too…we also heat with wood in the winter. We’ve got the same mild weather system here; our snow has all melted in the past few days (rendering my new xmas snowshoes sadly useless…I see you got a pair too!) From your descriptions of your environs, I’ve come to suspect we’re rather close neighbours (well, close from a blogosphere perspective, anyway :-) ) Here’s hoping for a little more snow coming our way! You give your location as eastern Ontario, TGIQ, and I presume you’re attending Carleton, or perhaps Queen’s, and therefore live close to one or the other. We’d be about halfway between the two, just off Hwy 7 west of Perth. So not too far! Hope you’ve had a chance to get out on the snowshoes the last little bit, with our recent accumulation. 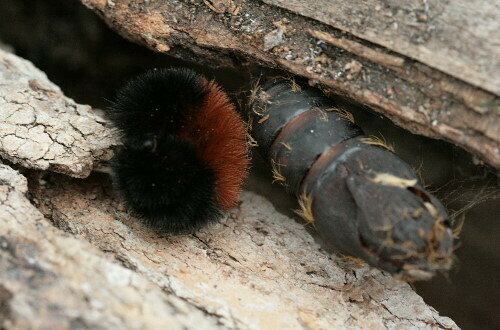 That is an amazing discovery, I never could have imagined the diversity that hides hibernates in wood logs during winter! Thanks for such a great post. 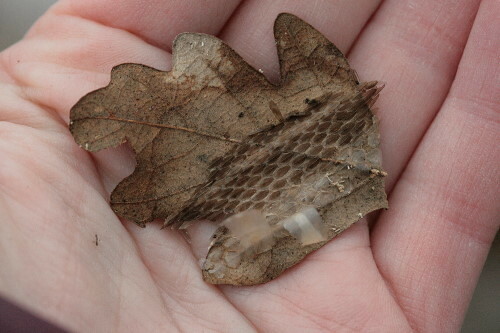 I absolutely love the picture of the leaf with a part of snake molt stuck to it. Happy New Year! Thanks, Ani! Hope your new year’s off to a good start, too! Isn’t it just amazing. How many people even wonder what goes on inside their woodpile? Enjoyed reading your post today and seeing all the goodies. 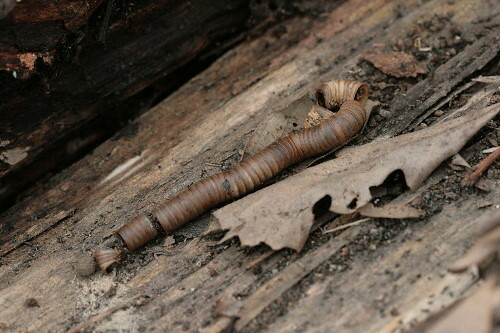 I am especially drawn to the millipede exoskeleton. I think I might have overlooked that thinking it was just a peel of wood. It’s like getting Christmas all over again! Just like, Ellen! Only less paper to recycle at the end of the morning. A whole universe in a pile of firewood, i guess one has to look to find something. Beautiful photographic documentation. That’s one of my favourite things about nature, Francis. We walk by so much every day. I love stopping and spending time poking around someplace to see what I can turn up, whether it be a small patch of flowers, or the trunk of a tree, or a pile of firewood. What hidden treasures! The snakeskin is beautiful. Raven seems to have enjoyed the exploration. I shall look up Lemon Drops – a fungus, I presume. 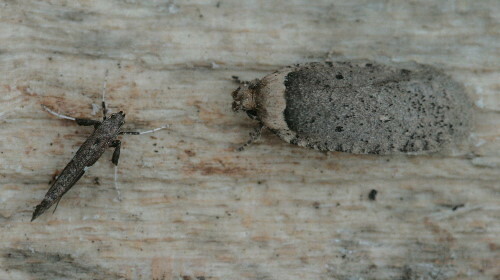 Lichen is having a great time here at present in the damp conditions. Thanks, Caroline! 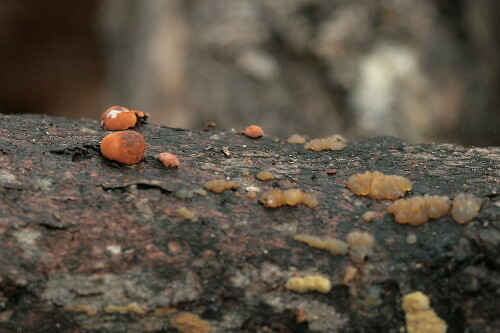 Yes, Lemon Drops are a type of fungi. Raven loves any sort of exploration, and she’s helped to turn up her share of discoveries, too. Don’t forget the mammals, although they all went into hiding when they heard you coming. Woodpile-less, I nonetheless have numerous flower pots, the undersides of which inevitably yield some invertebrate goodness every fall when I tidy up. Well, Mthew, there’s one black one there, does that count? :) I’m sure that in the autumn the chipmunks and Red Squirrels also spend a bunch of time in the piles, but they were all in their dens at that time. It’s interesting what can be found under stone-like things like flowerpots over the course of a summer. 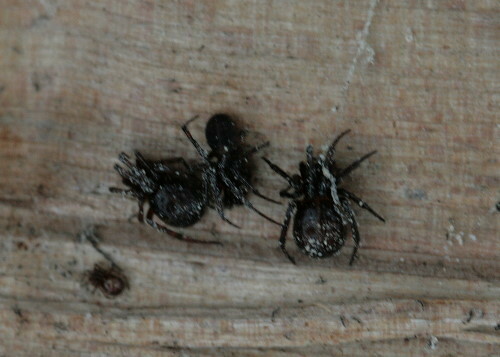 Great post as usual :-) I recognize the “white-bellied spider” as the “Eastern Parson Spider,” Herpyllus ecclesiaticus. The cellar spider is indeed a male Pholcus phalangioides. 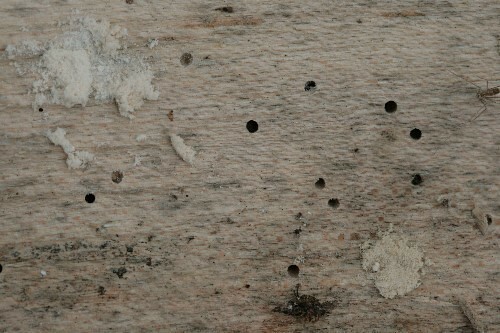 The “buckshot” holes and sawdust are the work of deathwatch beetles in the Anobiidae family. 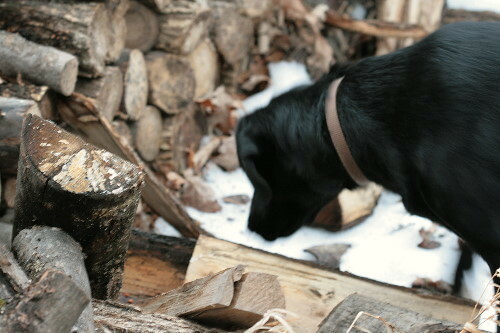 Now I’m wishing *I* had a log pile to explore :-) Happy New Year, dear. Thanks, Eric! You’ve solved a long(ish)time mystery of mine. 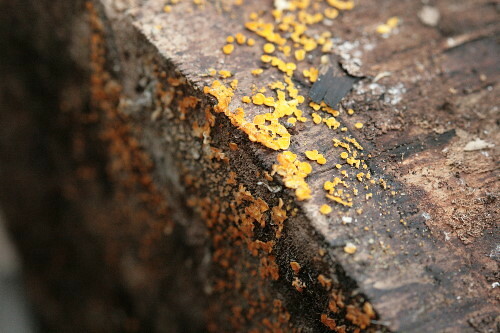 Last winter we were hauling firewood in from our woodshed, and about halfway into the stacks we started finding piles and piles of sawdust, and pretty much every log was sprinkled with tiny holes. Now I know what they belonged to! And a belated Happy New Year as well – hope it’s off to a good start! Many thanks for all the photos. We also heat–partially–with a wood-burning insert in our brick fireplace, and I have become a lot more interested in the natural world as a result of acquiring my own firewood. We notice a fair amount of bug, arthropod and even mammal activity in the racks in the back. 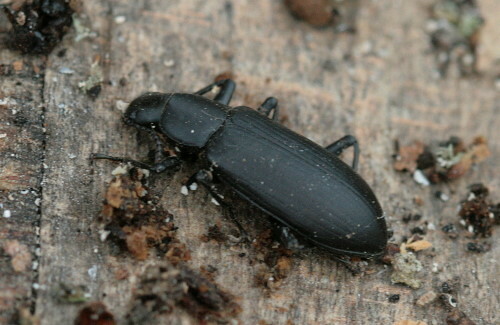 Although we live a good distance to the south of you, some of the critters are the same. 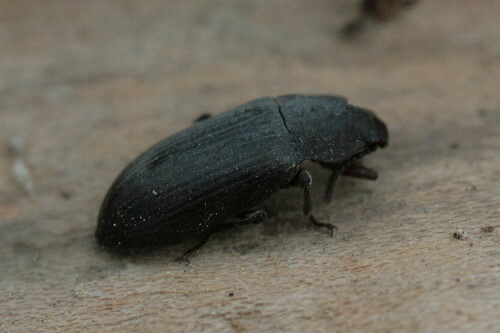 I was wondering in particular if you could ID the black beetles and the black spiders with large, round abdomens (3rd photo). 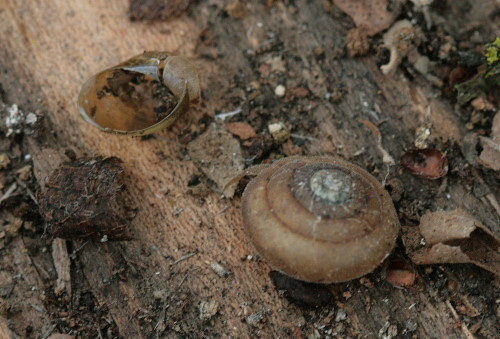 We see a lot of the latter, along with what I think are their hard, tan-colored egg casings. Any idea what they are? Also, what are the firewoods of choice in Ontario? Seabrooke, forgot to mention in my preceding post that we live in the U.S. in Maryland, halfway between the Washington and Baltimore.